Grew Up... in an ordinary town, with an ordinary life. Mikado didn't hate it, but as he puts it, "in my hometown, the sky seemed endless... but there was nothing to see." Living... in the Ikekuburo district of Tokyo, where he moves to attend high school. 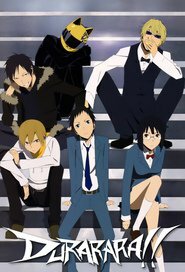 Part of this is because Mikado's best friend, Masaomi Kida, invites him to join him in the city. But part of it's also because Mikado was, frankly, bored with his small-town life. Ikekuburo, however, has adventure – and danger – lurking around every corner. Profession... high school student at Raira Academy. Though not a particularly outstanding student, Mikado reluctantly act as one of the two representatives for the class, with the other representative being quiet, buxom Anri Sonohara. Interests... exploring Ikekuburo, helping others, and chatting with his friends on the internet. Mikado spends a lot of time online, and he seems to have quite a proficiency for programming. Relationship Status... single, but crushing massively on Anri. Everyone can see it, including her, but Anri's unused to having friends and Mikado's too shy to try anything. Personality... polite, idealistic, and outwardly meek, but with a strong inner will. At first glance, Mikado seems like your average guy-next-door – and for the most part, he is. But don't be fooled: behind his humility and reticence, this naive newcomer is much more capable than he appears. Mikado Ryugamine's popularity ranking on CharacTour is #630 out of 5,000+ characters. See our top-ranked characters and read their profiles.